I’m pleased to support the TAFE Community Alliance. 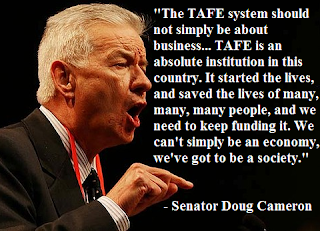 TAFE is an absolute institution in this country. It started the lives, and it saved the lives of many, many, many people, and we need to keep funding it. We can’t simply be an economy, we’ve got to be a society, and TAFE is fundamental to a good society.